Inspired by our recent "Time" assignment on our Flickr Forum, I decided to have a go at one of those shots where you have the same person in it lots of times (eg me!). Ok, this was my first attempt at this type of capture, but there's a few things worth thinking about before you start. 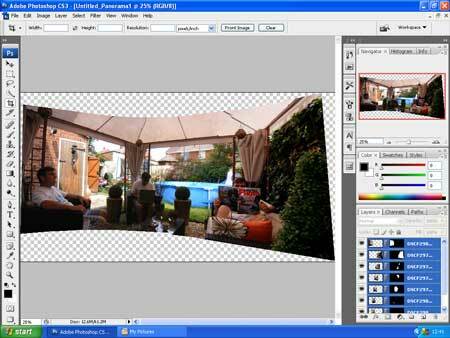 Use a tripod, and put the camera in the Portrait Orientation. Make sure as the camera swings around it stays level and doesn't start to dip or rise. To get most things in focus you'll have to use a small aperture (in aperture priority or program mode) - I think I used F13.6 on this one, but that also means that if its dull (as it is under this canopy) you'll have to increase the ISO so that the people in your photo don't get blurred. There is an alternative, I think what I should have done was gone to full manual, exposed for the garden in the Sunlight, then used Forced Flash to light up the "me's" sitting in the chairs. Next time. You're going to be using your self timer, so have all the props you'll need near by (but not in the frame) and try not to knock anything or move anything as you are rushing around. Take extra care that as you're pressing the shutter button for your shot that you're not right in front of the camera, as if you are your Auto Focus could concentrate on the wrong area! Ideally you want a day when the light is steady through the ten minutes or so it will take you to do the shots (or shoot inside), if the Sun keeps peeping out from behind heavy clouds you'll have issues with certain sections of the Panorama with different exposures. 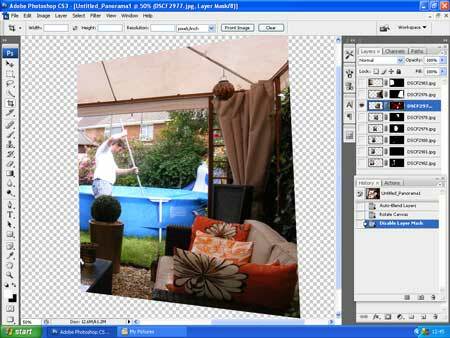 If you compare this shot with the one near the top of the screen, you'll notice that although the Garden is complete, Photoshop has "masked out" some of the versions of me - not what we want! The next step is to click through the eye icons (starting at the top of the layers palette) to find out which layer has the hidden person that we want to reveal. 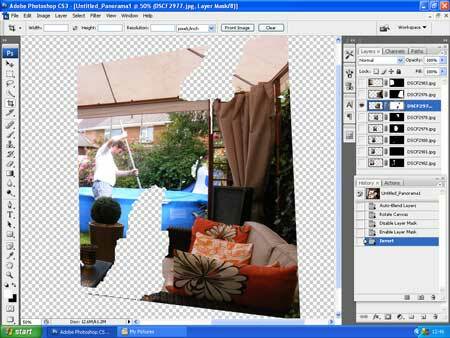 Note how that Photoshop aligns and merges the layers - by using masks. 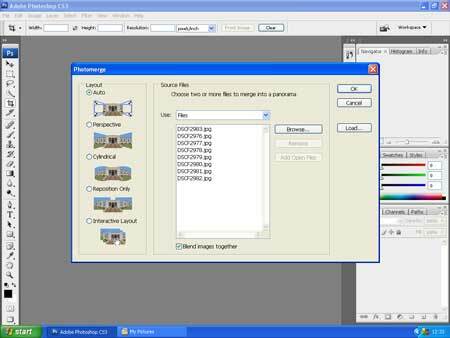 So when you find the first layer that you think has the hidden person in it, click on the layer mask (the little black box) and then right-click "disable layer mask"
So we've found the layer we want to work on, and the easiest way to do this is to right click the layer mask and re-activate it, Then (this is the important part) click on the mask and press "ctrl I". This inverts the mask, so we can see what we need to mask out, rather than try and guess where the subject is, and mask it in. This will help us to change the mask without painting out extra areas. 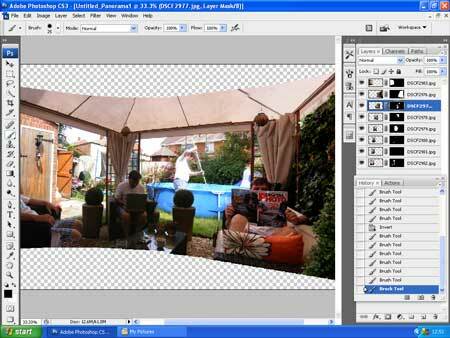 If all the photos in your Panorama are exactly exposed you don't need to be very accurate. If they're not, you may get better results if you stick as close to the edges of the subject as possible, so zoom right in and take your time. 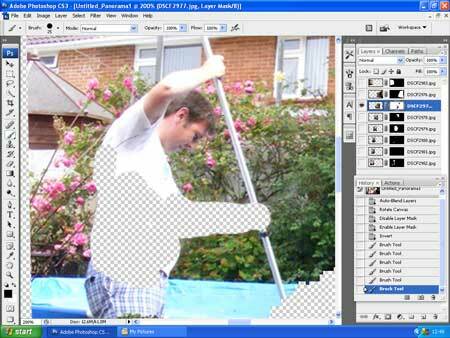 Now you just start working on the next layer (and mask) that has a hidden person. Where you have people close or over-lapping each other, take your time, and you may have to keep flicking back and forth between the layer masks until you get the look you want. Once all the "me's" have been revealed, save the file as a .psd, then flatten the image, rotate, crop, and apply your normal Photoshop editing work-flow. Then get it up on Flickr! Hope this helped, thanks for reading!